President Trump blamed the attack, which he said was carried out by the Syrian government, on former president Barack Obama, calling it a “consequence” of Obama’s “weakness and irresolution.” The reference was to Obama’s decision not to follow through with a threat to use military force against Syrian President Bashar al-Assad after a 2012 chemical attack. In a statement released by the White House — just days after the administration said action against Assad was not a U.S. priority — Trump called the Tuesday attack “reprehensible” and said that it “cannot be ignored by the civilized world.” At the United Nations, U.S. Ambassador Nikki Haley called for an emergency meeting of the Security Council. 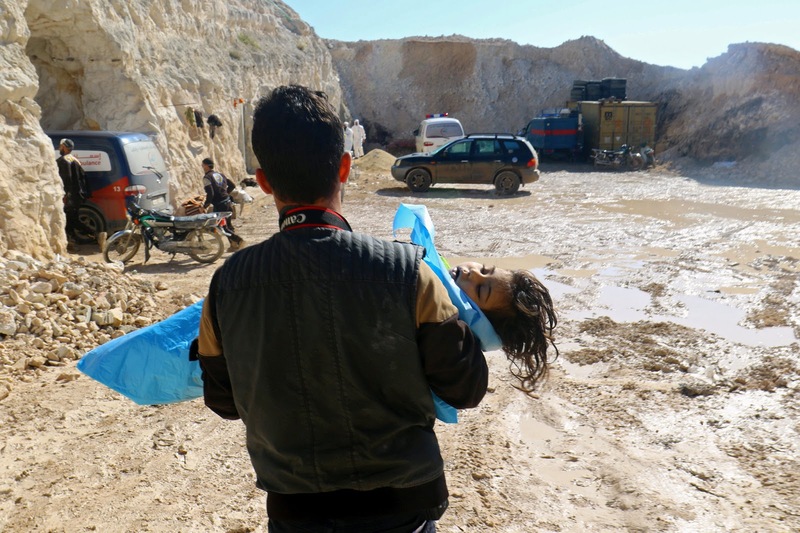 Syrian government warplanes in recent months have launched heavy attacks across northern Idlib province, where hundreds of thousands of civilians — many having fled other battle zones — are squeezed together among much of what remains of the armed opposition to Assad. Syria’s Foreign Ministry denied involvement in Tuesday’s attack, saying the government was committed to its obligations under the international Chemical Weapons Convention. Syria joined the convention in 2013 after launching sarin attacks on several Damascus neighborhoods — strikes that killed hundreds of civilians and pushed the United States to the brink of military intervention. Congressional refusal to vote in favor of U.S. military action after Assad’s use of sarin, a nerve agent, in 2012 provided Obama with cover to withdraw his ultimatum, although he continued to call for Assad to leave power. The United States and Russia, Assad’s main backer, then negotiated a plan for the internationally supervised removal of Syria’s chemical weapons stocks. In Washington, Senate Foreign Relations Committee Chairman Bob Corker (R-Tenn.) echoed Trump’s criticism of Obama, saying that the former president had “figuratively jumped in [Russian President Vladimir] Putin’s lap” to agree on the weapons withdrawal. 0 Response to "Worst Chemical Attack in Years in Syria; U.S. Blames Assad"